The Max Planck Florida Institute for Neuroscience (MPFI) announces Dr. Viviana Gradinaru, as the inaugural Peter Gruss Young Investigator Award recipient. Paying homage to Dr. Peter Gruss, former Max Planck Society president, the biennial accolade recognizes young neuroscience investigators for significant contributions to the scientific community. Gradinaru is Assistant Professor of Biology and Biological Engineering and Heritage Principal Investigator at the California Institute of Technology. Dr. Gradinaru’s work focuses on developing and using optogenetics and tissue clearing to better understand brain circuitry underlying neurological disorders such as Parkinson’s Disease. She was nominated by Dr. Karl Deisseroth, Howard Hughes Medical Institute Investigator, 2013 Brain Prize Winner, and 2016 Breakthrough Prize in Life Sciences Winner – whom she studied under while completing her neuroscience doctorate at Stanford University. 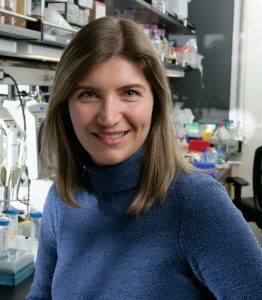 Dr. Rafael Yuste, Director of the NeuroTechnology Center at Columbia University, wrote in a letter of support for Dr. Gradinaru’s nomination, “Viviana has a stellar career, with brilliance at every step of the way,” remarking that her current research could go on to revolutionize the treatment of brain diseases using molecular therapies. Earlier this year, Dr. Gradinaru was honored by President Obama as one of the recipients of the Presidential Early Career Awards for Scientists and Engineers, the highest honor bestowed by the United States Government on science and engineering professionals in the early stages of their independent research careers. The Peter Gruss Young Investigator Award will be presented to Gradinaru during MPFI’s Sunposium conference, February 13-14, 2017 at the Palm Beach County Convention Center. As the Award recipient, Dr. Gradinaru will be invited to deliver a plenary lecture at the Sunposium 2017 conference. Dr. Gradinaru will also receive a monetary award underwritten by Ms. Raquel Rodriguez of Miami, Florida. Ms. Rodriguez, a long-time supporter of MPFI and the life science industry, has contributed the award in honor of Dr. Peter Gruss’s legacy. Learn more about the Peter Gruss Young Investigator Award here. Learn more about Dr. Gradinaru’s groundbreaking work here. The Peter Gruss Young Investigator Award is given biennially to recognize a young neuroscience investigator for significant contributions to the scientific community through collaboration, creativity, and curiosity-driven research. In addition to recognizing outstanding achievements, it also serves to support research, inspire young scientists, promote collaboration, and acknowledge the outstanding legacy that Dr. Peter Gruss built throughout his honorable career at the Max Planck Society. The Max Planck Florida Institute for Neuroscience (MPFI), a not-for-profit research organization, is part of the world-renowned Max Planck Society, Germany’s most successful research organization with over 80 institutes worldwide. Since its establishment in 1948, 18 Nobel laureates have emerged from the ranks of its scientists. It has produced over 15,000 publications, more than 3,000 inventions and over 90 spin-off companies, putting it on par with the best and most prestigious research institutions in the world. As its first U.S. institution, MPFI brings together exceptional neuroscientists from around the world to answer fundamental questions about brain development and function and to develop new technologies that make groundbreaking scientific discoveries possible. Their research is shared publicly with scholars, universities and other organizations around the globe, providing the necessary foundation of knowledge to develop treatments and cures for brain disorders such as autism, schizophrenia, Parkinson’s disease and Alzheimer’s disease. For more information, visit www.maxplanckflorida.org.